Budgeting is theoretically very simple, but practically very difficult. You may find the numbers in your spreadsheet fit together beautifully, but its a very different story when you’re browsing on the net and find the perfect leather jacket/suit/stroller (choose the appropriate status symbol for your age and stage). That’s why so many budgets don’t work, and why my budgeting advice starts with one very simple concept. Friction. Friction, in this context, is how easy or hard it is to complete a task. You’ll notice that whenever you download a well-designed app its insanely easy to sign up and get started. Conversely when you try to cancel a subscription the button is always tricky to find and requires multiple steps. It’s no accident, designers know that when they place obstacles (or friction) into a task people are less likely to complete it. In the context of budgeting we’re going to use friction to our advantage. All the things we know we should be doing — saving, paying bills promptly — we will reduce the friction on. All the things we shouldn’t be doing — basically spending money we shouldn’t- we will increase the friction on. Let’s find out how! Now we’re going to define each of these categories more accurately. This is your after-tax salary, i.e. the amount that gets paid to your bank account from your employer. This is any income other than your salary. For example you may receive interest on your savings account or dividends on shares. Estimate by looking back through a few months of statements, but don’t get hung up on getting it perfect. A consistent amount that you save each month. It is easiest to express this as a percentage of Money In, i.e. “I want to save 10% of my earnings”. There are a huge number of factors which will determine how much you should save, and I’ll be writing a separate post entirely on savings and investment. For now, aim for a minimum of 10%. The monthly amount of rent you pay excluding bills. This should be less than 40% of your salary, and ideally around 25%. It’s the biggest monthly expense so if you’re looking to reduce your Money Out start here. Paypal or credit card statements. When I did this I realised I was paying for a bunch of subscriptions I no longer used. Easy saving! Everything that’s left. This is for food, commuting, beer, …whatever! If you don’t spend it all in a month then the money piles up for next month. You can get clever and start to set aside money for larger expenses, for example holidays, and I’ll cover methods of doing so in a later article. This is the simplest possible way to manage your spending. 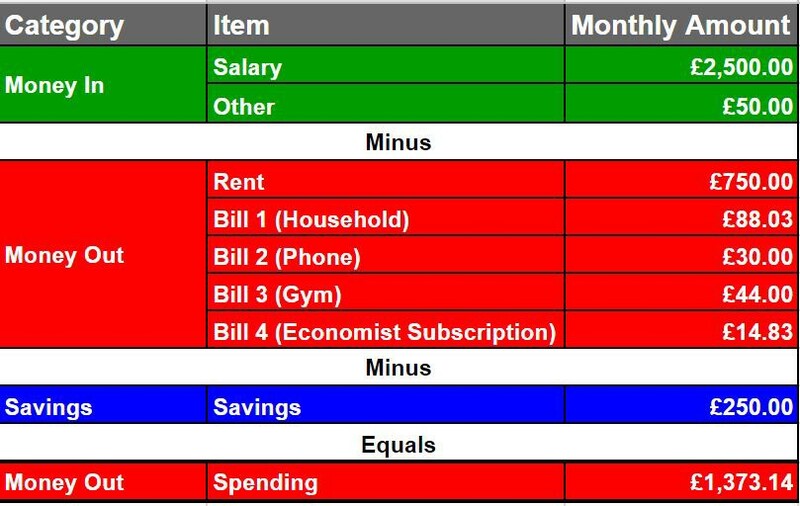 Here is an example of what the monthly budget looks like. You can view the spreadsheet here and copy it to use yourself. There are many, many budgeting apps available — I feel there’s enormous benefit in doing your own from scratch because you’re forced to really understand how the pieces fit together. So how do you put this into practice? You will need two sets of bank accounts. The first is your Primary Bank where your salary gets paid, bills are paid from and you keep a savings account. 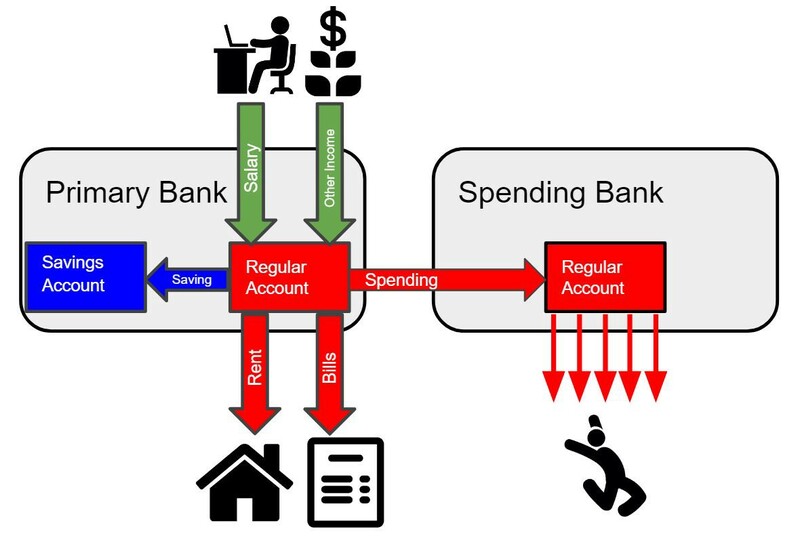 The second is your Spending Bank, where you keep money in the Spending category, and it must be completely separate! There are lots of new app-only banks which can be set up very quickly — check out Monzo, Starling, Atom, Revolut, Loot or Monese. Monthly transfer to your Spending Bank. You can only carry the Spending Bank card with you each day; this is the money you are allowed to live on. Your rent, bills and savings are automatically paid each month. Rather than have to remember what outgoing payments are coming up, or try to exercise restraint in order to have money left over for saving, you can spend whatever you see in your Spending Bank account until the next funding payment. Like I said at the outset, successful budgeting is about friction. By following these steps the things you know you should be doing are executed automatically (no friction. Spending over your limit means either digging up your other bank card or logging on to manually transfer money across (lots of friction). The hassle of this will blunt any impulse spending. What are direct debits and automatic payments? Direct debits are permission from you for a business to take money straight out of your bank account, for example a gym debiting your account for membership fees. Most businesses which take periodic payments will offer direct debit as a payment option. Automatic payments are payments which you setup manually to send a certain sum to a business or person weekly/monthly/quarterly. Every bank will allow you to do this — it should be easy to figure out on your online banking platform. What about irregular but important expenses like car registration? The best method is to figure out how much they will cost monthly (e.g. a yearly car registration of $240 is $20/month) and add into your ‘bills’ calculation. Even if the money doesn’t go out each month it will pile up so that you can pay it safely out of your main bank account. What about saving for particular goals like a house deposit, or an overseas holiday? I’ll cover methods of saving in another article. I prefer to keep a weekly Spending amount so I don’t end up eating baked beans on toast before pay day. By all means, just change automatic payment #4 to a weekly amount (multiply by 12 then divide by 52).